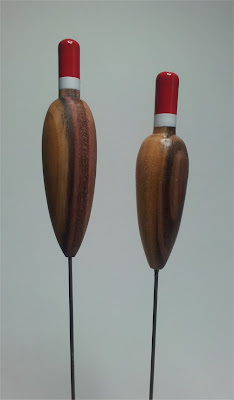 I had mentioned before the Scottish Damson wood, this time I managed to make 2 floats from the same length of wood. Very nice colouring to the wood and a very distinctive patter, the body and tip were turned as 1 piece, with 1mm stainless steel wire making the stem, quite chunky in appearance perhaps the tips should have been a bit longer but very pleasing floats. Body lengths are 50 & 40mm with the diameter being around 13mm.